As we know microcontrollers take analog input from analog sensors and use ADC (Analog to Digital converter) to process those signals. But what if a microcontroller want to produce an analog signal to control analog operated devices like a Servo motor, DC motor etc? Microcontrollers don’t produce output voltage like 1V, 5V instead they use a technique called PWM for operating analog devices. An example of PWM is our laptop’s cooling fan (DC motor) which needs to be speed controlled according to the temperature, and the same is implemented by using Pulse Width Modulation (PWM) technique in motherboards. In this tutorial we will control the brightness of a LED using the PWM in ARM7-LPC2148 microcontroller. PWM is a good way to control the analog devices using digital value like controlling motor’s speed, brightness of a led etc. Although PWM doesn’t provide pure analog output, but it generates decent analog pulses to control the Analog Devices. PWM actually modulates the width of a rectangular pulse wave in order to get a variation in the average value of the resulting wave. The percentage of time in which the PWM signal remains HIGH (on time) is called as duty cycle. If the signal is always ON it is in 100% duty cycle and if it is always off it is 0% duty cycle. Check all the PWM related projects here. The image below indicates the PWM output pins of ARM7-LPC2148.There are total six pins for PWM. Before getting into our project we need to know about the PWM registers in LPC2148. Use: It’s a 32-Bit register. It contains the number of times (minus 1) PCLK must cycle before incrementing the PWM Timer Counter (It actually holds maximum value of prescale counter). Use: It a 32-bit register. It contains the incrementing counter value. When this value equals the PR value plus 1, the PWM Timer Counter (TC) is incremented. Use: It contains the Counter Enable, Counter Reset and the PWM Enable control bits. It is an 8-Bit register. 1- Resets PWMTC & PWMPC on positive edge of PCLK. Use: It’s a 32-Bit register. It contains the current value of the incrementing PWM Timer. When the Prescaler Counter (PC) reaches the Prescaler Register (PR) value plus 1, this counter is incremented. Use: It’s a 16-Bit Register. It contains the interrupt flags for PWM Match Channels 0-6. An interrupt flag is set when an interrupt occurs for that channel (MRx Interrupt) where X is the channel number (0 to 6). Use: It’s a 32-Bit register. Actually the Match Channel group allows setting 6 single-edge controlled or 3 double-edge controlled PWM outputs. You may modify the seven Match Channels to configure these PWM outputs to suit your requirements in PWMPCR. Use: It’s a 32-Bit register. It contains the Interrupt, Reset and Stop bits that control the selected Match Channel. A match occurs between the PWM match registers and PWM Timer counters. 0- Disable PWM Match interrupts. 1- Enable PWM Match interrupt. 0- Disable the PWM stop feature. 1- Enable the PWM Stop feature. Use: It’s a 16-Bit register. It contains the bits that enable PWM outputs 0-6 and select single-edge or double-edge control for each output. 1- Double Edge Mode for PWMx. Use: It’s an 8-Bit Register. It contains the Match x Latch bits for each Match Channel. 1- Load the new Match values from (PWMMRx) PWMMatch Register when the timer is reset. Now lets start building the hardware setup to demonstrate the Pulse Width Modulation in ARM microcontroller. LED’s ANODE is connected to the PWM output (P0.0) of LPC2148, while LED’s CATHODE pin is connected to GND pin of LPC2148. 1. A voltage regulator of 3.3V is used here to provide analog input value to the ADC pin (P0.28) of LPC2148 and because we are using 5V power we need to regulate voltage with voltage regulator of 3.3V. 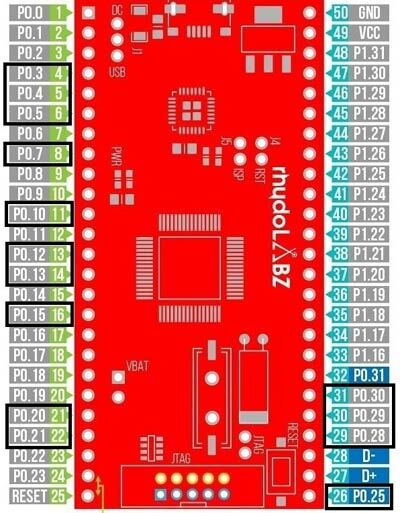 To Program ARM7-LPC2148 we need keil uVision & Flash Magic tool. We are using USB Cable to program ARM7 Stick via micro USB port. We write code using Keil and create a hex file and then the HEX file is flashed to ARM7 stick using Flash Magic. To know more about installing keil uVision and Flash Magic and how to use them follow the link Getting Started With ARM7 LPC2148 Microcontroller and Program it using Keil uVision. In this tutorial we will use ADC and PWM technique to control the brightness of the LED. Here LPC2148 is given analog input (0 to 3.3V) via ADC input pin P0.28, then this analog input is converted into digital value (0 to 1023). Then this value is again converted into digital value (0 - 255) as PWM output of LPC2148 has only 8-bit resolution (28). LED is connected to PWM pin P0.0 and the brightness of the LED can be controlled using the potentiometer. To know more about ADC in ARM7-LPC2148 follow the link. Step 1:- The very first thing is to configure the PLL for clock generation as it sets the system clock and peripheral clock of LPC2148 as per programmers need. The maximum clock frequency for LPC2148 is 60Mhz. Following lines are used to configure PLL clock generation. Step 2:- Next thing is to select the PWM pins and PWM function of LPC2148 by using PINSEL register. We use PINSEL0 as we use P0.0 for PWM output of LPC2148. Step 3:- Next we need to RESET the timers using PWMTCR (Timer Control Register). Step 4:- Next we need to set the PWMMCR (PWM match control register) as it sets operation like reset, interrupts for PWMMR0. Step 5:- The maximum period of the PWM channel is set using PWMMR. Step 7:- To enable the PWM output to the pin we need to use the PWMTCR for enabling the PWM Timer counters and PWM modes. Step 8:- Now we need to get the potentiometer values for setting duty cycle of PWM from ADC pin P0.28. So we use ADC module in LPC2148 for converting potentiometers analog input (0 to 3.3V) to the ADC values (0 to 1023). Here we are converting the values from 0-1023 to 0-255 by dividing it with 4 as PWM of LPC2148 has 8-Bit resolution (28). The following lines capture the Analog input (0 to 3.3V) and convert it into digital value (0 to 1023). And then this digital values are divided by 4 to convert them into (0 to 255) and finally fed as PWM output in P0.0 pin of LPC2148 on which the LED is connected. 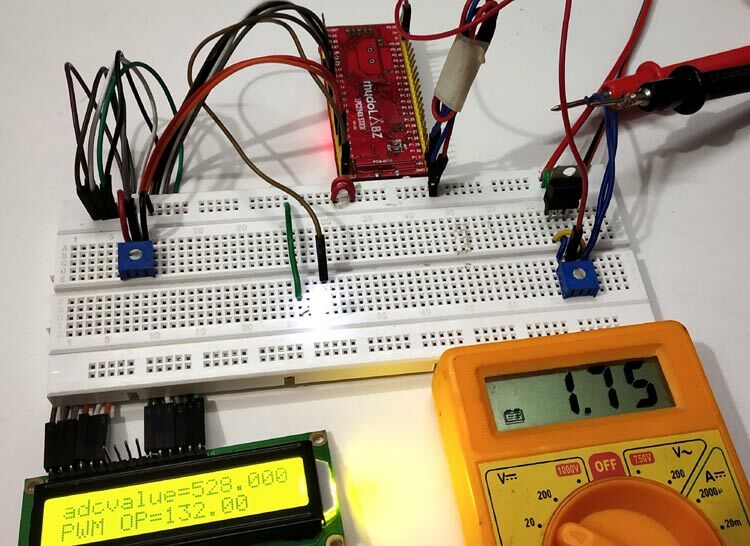 As we connected LCD in 4-Bit mode with LPC2148 we need to send values to be displayed as nibble by nibble (Upper Nibble & Lower Nibble). So following lines are used. To display those ADC & PWM values we use following lines in the int main() function. Complete code and video description of the tutorial are given below.